(L-R): VRev Fr George Ursache (Central States), VRev Dr Remus Grama (Great Lakes), Rev Fr Liviu Alexandrescu (Eastern Canada), Rev Fr Dan Hoarste (Vicar), Rev Fr Ionut Maerean (Central Canada), His Eminence Archbishop NATHANIEL, Rev Fr Adrian Grigoras (Pacific Southwest), Mr David Oancea (Chancellor), V Rev Chesarie Bertea (Atlantic), V Rev Fr Ian Pac-Urar PhD (Facilitator), Rev Fr Gabriel Agoston (Pacific Northwest). [Rev Fr Nicolae Lapuste (Western Canada) and Rev Fr Florin Stoleru (Southern) were unable to attend]. Also click on the following link for another Gallery/Video presentation: http://bunavestire.ca/2015/07/30/albumul-taberei-de-vara-sf-maria-iulie-2015/. Click here to view photos [(c) Greg Sotak 2012] from the Hierarchal Divine Liturgy for the great feast of the Theophany of the Lord at which His Eminence, Archbishop Nathaniel ordained Florin Bica to the Holy Priesthood and Ionel Satnoianu to the Holy Diaconate. Click on the following link to view a slide presentation: http://photographs.iustincapsa.com/2011-11-12/index.html. With the blessings of his Eminence Archbishop Nathaniel Popp of the Romanian Orthodox Episcopate of America, St. Nicholas Summer Camp was held this year from Sunday, July 11th to Saturday, July 17th. The beautiful scenic site above Echo Lake in the Qu’Appelle Valley, Saskatchewan, Canada, which has welcomed children and staff for over three decades, this year hosted a small but enthusiastic group of 16 campers from Saskatchewan and British Columbia. Four little ones, overjoyed to be part of the camp, rounded out the number of participants. Seven staff members did their best to ensure a smooth running of the camp for the entire week. Rev. Fr. Cosmin Vint was Camp Director and Administrator, and Megan Tokaruk was Program Director. Kathie Crawford of Moose Jaw was the Camp Cook. The rest of the staff assisted wherever needed throughout the week. The camp opened with prayers in the beautiful church of the Centre led by Rev. Fr. Cosmin Vint, followed by a welcoming address and introductions with an outline of the camp rules. After supper, the first campfire of the week was a sheer joy with singing and games. Every day started with morning prayers and came to a close with evening prayers to which all were summoned by the echoing sounds of the church bells. The theme of this year’s camp was “Following Christ”. The teaching sessions were centred on how to be a follower of Christ in the church, in the home and in society. Reverend Fathers Cosmin Vint, Cosmin Sicoe, and John Maerean and V.Rev. Fr. Daniel Nenson worked as a team to provide the spiritual instruction offered to the participants. At the end of each teaching session the campers, under the guidance of Fr. Cosmin Vint, had the opportunity to work on their very own painting of the church where they prayed and grew in faith and fellowship at camp. They also painted the lake and the rest of the scenery surrounding the church. The young “artists” were done just in time to take back home the image on canvas of the place where they spent a fruitful week of their summer vacation. Arts and crafts, sports, music, camp-wide games, fishing, hiking, mini-golf, trips, mini-Olympics, beach games, skits/talent show were all included in the fun and learning experience at this camp. The fish hatchery in Fort Qu’Appelle and the National Historic Site of Motherwell Homestead near Abernethy were visited during the week. Campers marveled at the beauty of the rainbow trout as they were jumping out of the water to get their best snack tossed by the attendant; assuredly, they had lots of fun as they were given a ride in an old-fashioned wagon pulled by heavy-draft horses, which were just two of the attractions at the points visited. Everybody attended Holy and Divine Liturgy on Thursday morning. After going to the holy sacrament of Confession the previous evening, all the campers received Holy Communion and were encouraged to make an offering to the church. Each one offered something in the envelopes provided for that purpose, and all of them understood that whenever you go to church for Holy and Divine Liturgy, you are responsible to offer as much as you can in the offering basket, because God gives to you continuously. They were advised that it is not important how much you offer, but rather that you offer something on a regular basis. 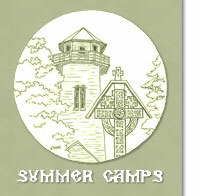 For a visual tour of this year’s activities at camp, please visit our website at www.saintmarycanada.com. Glory be to God for all things! Renovation of Bishop's Residence (the "Big House") Underway! Renovation of Bishop's Residence underway! Join the campaign today to bring the project to completion!